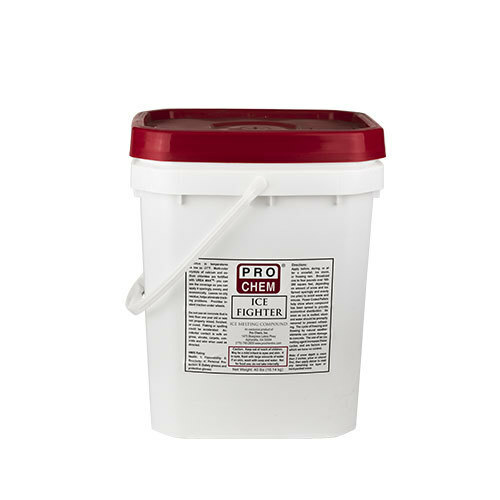 Ice Fighter | Pro Chem, Inc.
ICE FIGHTER is an ice melting compound that consists of multicolor crystals of calcium, potassium, and sodium chlorides that are fortified with UREA MAX. It is effective all the way down to -21°F. It is easy to apply and economical because you can see the coverage, which helps to avoid over application. ICE FIGHTER is safe for use on properly cured concrete and anywhere traction is needed to reduce risk of injury. For best results, use a cup, scoop, or broadcast spreader to apply. Spread product sparingly and evenly (1.5 to 3 oz. per square yard), then remove melted ice/snow or slush. Apply shortly after a snow begins to assure easy removal of snow and prevent ice build-up. Note: If snow depth is more than 2 inches, plow or shovel first, then apply deicer to melt any remaining ice layer or hard-packed snow. Notice: As with all deicers, use only on properly placed and cured concrete. 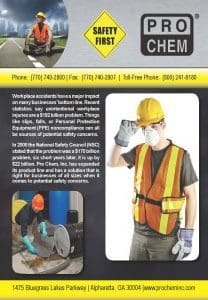 Do not use on porous or improperly cured concrete, or concrete less than one year old. The cycle of freezing and thawing by natural weather elements can cause damage to concrete. The uses of an ice melter increase these cycles, and are factors over which we have no control. Use of deicers on porous brick, mortar joints, flagstone and precast or prestressed concrete is not recommended. All deicers can be harmful when applied directly to trees, shrubs, flower beds or grass. Remove any melted ice, snow, and slush from vegetation area. Ice melting agents that are applied at much greater rates than recommended may interfere with traction or footing, and may cause tracking indoors. Use of this product must be at the consumer’s risk. Do not use where product might come in contact with an airplane.